Here is an easy Mexican dessert recipe that will delight your guests with it’s light and refreshing almond taste. 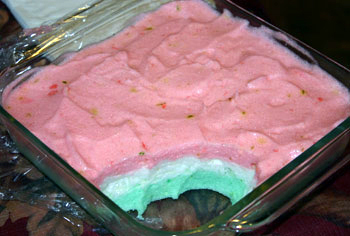 It’s called Almendrado and resembles the Mexican flag with it’s green, white and red egg-white layers. Almendrado also consists of a thin custard sauce which is drizzled over the “flag” and then topped with sliced almonds. This festive and easy Mexican dessert recipe is the perfect way to finish off your next Mexican dinner. Add the gelatin to the cold water and stir. Place this mixture in a double boiler and heat until the gelatin dissolves. Remove from heat and let it cool on the counter. In a large mixing bowl, beat the egg whites until they start to get stiff. Gradually add the sugar and salt one tablespoon at a time while mixing. Then add the cooled gelatin, almond extract and lime zest. Mix until well combined. You can cool the gelatin in the refrigerator for 5 or 10 minutes but you must make sure it doesn’t stiffen too much or it will be difficult to blend into the egg whites. You just don’t want to add hot gelatin to the egg whites. Divide the egg whites into three separate bowls. Tint one bowl green and one red (the red will really be pink when mixed with egg whites). Fold the food coloring in and mix well to distribute the color evenly. Using a tablespoon, layer the green egg whites in the bottom of a glass dish. An 8 inch by 8 inch pyrex dish works well. You can also use a mold if you like. Then add the white layer and last the red layer. Spreading the layers with the back of a spoon works well. Cover the dish with plastic wrap and chill in the refrigerator. In a medium sized bowl add the egg yolks, sugar, 1/2 cup of half and half, the vanilla and almond extracts and whisk until well blended. Scald the 1 1/2 cups of half and half in a double boiler. Turn the heat to low to medium low and wait until the half and half steams and there are bubbles around the edge of the pan. You do not want this to come to a full boil. Slowly add the egg yolk, 1/2 cup half and half, and almond mixture to the scalded milk stirring the whole time. Cook until the mixture coats the back of a metal spoon, about 2 minutes. Stir in the lemon zest. Pour immediately into a bowl or glass measuring cup and place on a bowl of ice to cool. Once it’s cool enough, cover and place in the refrigerator. 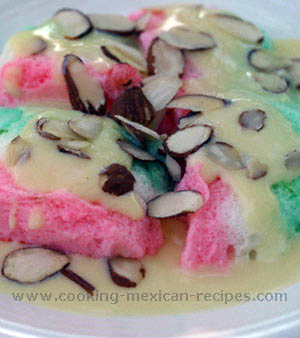 This easy Mexican dessert recipe is ready to serve after it’s chilled for two to three hours. Here is how you serve it. Slice the egg white mixture and place on a plate and pour or spoon custard sauce over the top. Sprinkle sliced almonds all over. If you like the toasted almond taste like I do, then pour almonds on a baking sheet in a single layer. Bake for 3 or 5 minutes at 325 degrees until a nice golden brown. Watch closely or they will burn easily. Toasting the almonds will enhance the flavor of any dish. Check out more of our Dessert Recipes.